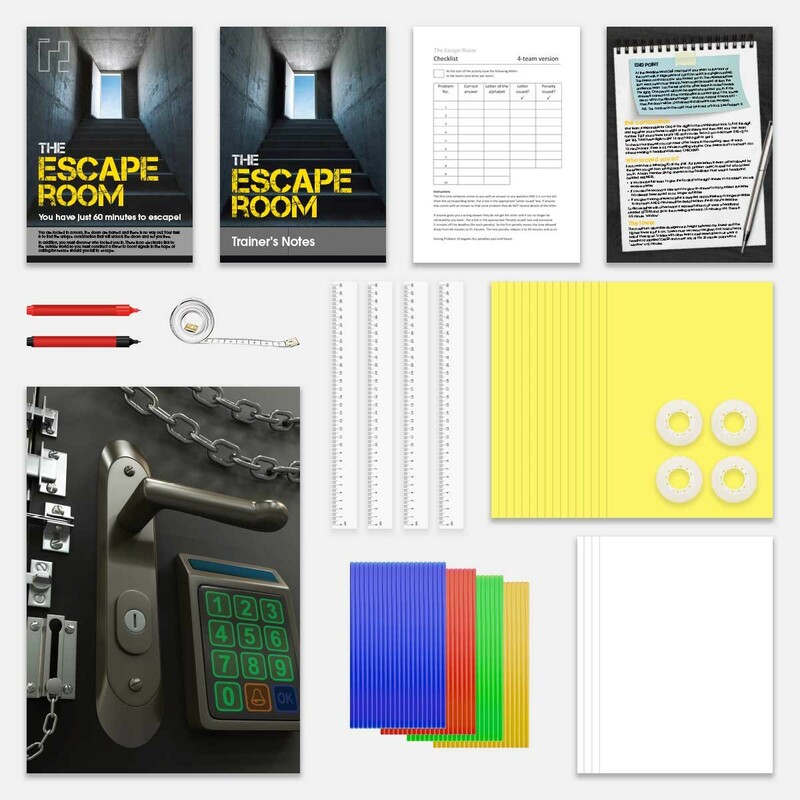 In this fun and challenging activity teams are locked in a room (in theory!). The doors are chained shut and there are just 60 minutes to escape! Can teams work together under time pressure to crack the code and unlock the doors?! To taste freedom teams must discover the vital lock combination that releases the door. The lock combination is made up of a number of digits. Each team must find ONE of those digits so that when used together in the right order they unlock the chains. Teams find the crucial digits by solving 8 problems. BUT- they are not all straightforward - it’s very easy to go wrong if you are not organized and paying full attention to every aspect. To ensure they solve the problems correctly teams need to work with each other rather than competing. Wrong answers incur time penalties. Two such penalties, for example, reduces the time available from the original 60 minutes to just 50 minutes. It’s a race against time - but more haste often means less speed! A correct solution to a problem earns teams a letter of the alphabet (although only the FIRST team with the right answer gets the letter). There are eight letters available which, when put in order together with other letters teams possess at the start, spell out who locked them in the room. Teams need to know this before they can escape. So the teams’ objectives are: find the combination, discover who locked them in and build a tower that meets certain criteria. 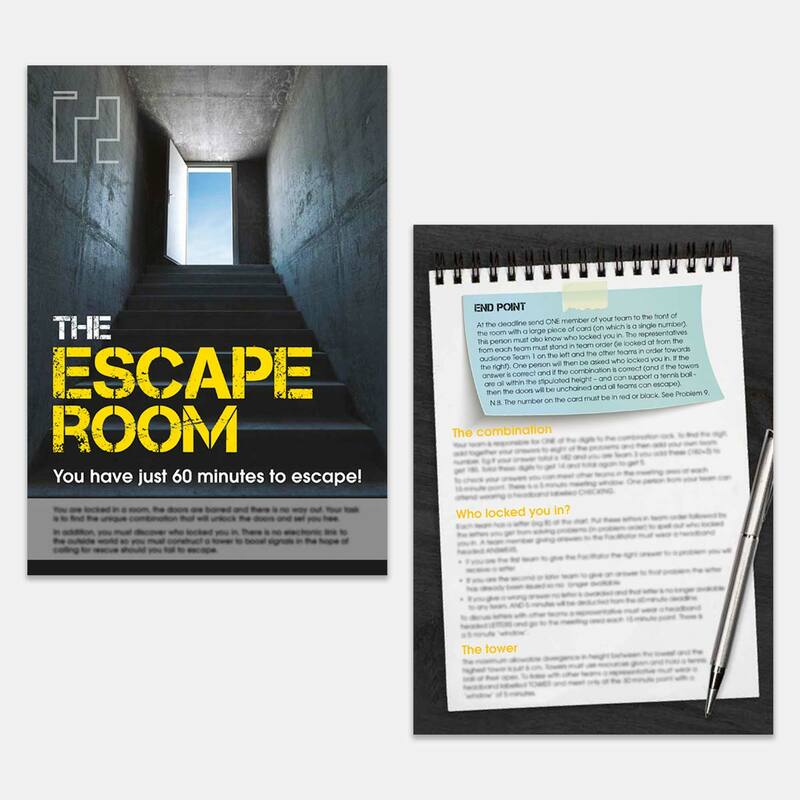 Divide the group into ten teams of 3-6 participants and set the scene, explaining that the doors to the room are 'locked and chained' (posters showing locked doors are provided to stick on the doors - the doors to the room are not actually locked). 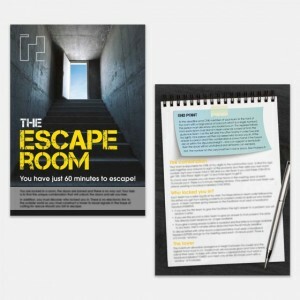 Issue the Team Briefs and team resources and announce they have 60 minutes to escape. Observe but do not get involved - except to stand by to receive teams’ answers to the problems. If the solution is correct, issue that team with a letter of the alphabet. If incorrect issue a 5 minute penalty to the whole group. At the deadline ask each team to announce their ‘digit’ that together make up the combination. Ask “Who locked you in?” and measure team towers. If ALL the criteria are met, within the deadline, then teams have achieved their objective and you can release the chains on the doors! They are FREE! Lead a debrief on the key lessons that were thrown into relief. Lots of issues to address, all covered in the Trainer’s Notes (along with a step-by-step guide). It’s very straightforward to run a session. They did ‘Belbin’ before lunch so The Escape Room enabled them to use their team roles. It reinforced the need to plan and read everything. They understood the link to real life where people don’t talk to each other and work in silos. All in all, a great exercise - it was the highlight of the course. I used The Escape Room and loved it! It worked really well and the learnings the team took were amazing. The biggest lessons were: to read the whole Brief carefully before getting down to work; to make the most of the time available and to maximise opportunities to meet other teams. The activity highlighted the benefits of working as a whole group – you need everyone. I will be running this again! 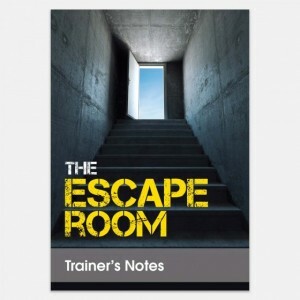 I have used The Escape Room activity a number of times with both smaller and larger teams and it has worked brilliantly each time. The teams have all loved it, it was enjoyable to facilitate and had some real beneficial learning - especially around the topic of collaboration. I would highly recommend it for any team events where you're wanting teams to learn together more effectively. The Escape Room highlights learning around communication and attention to detail. I've run it 4 or 5 times now with great success. It's challenging and fun! Great work Northgate - keep it up! I would highly recommend The Escape Room. We used it as part of a team build and the participants were very engaged as they wanted to escape so badly! The activity highlighted some really interesting areas for development around communication and team work which opened up some fantastic discussions within the group. We will certainly use the activity again when we get the chance!